Acrylic Leaflet Holders are a simple yet effective way to clean up your business. Whether it’s your seating area, desk or till that is clogged up with scattered leaflets, there will be a Literature Holder to suit your needs. No matter what kind of service or products you provide, you will have information to communicate. A great way of doing this beyond office hours is with leaflets that people can take away with them. 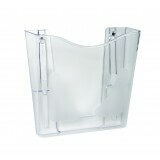 Leaflet Holders keep your business professional and tidy. Why do I need a Leaflet Dispenser? A Leaflet Dispenser is a necessity if you have any literature around your business for your customers or visitors to take away with them. 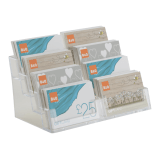 To create a good and lasting impression, you should have everything displayed neatly and professionally and a plastic Leaflet Holder is an affordable and simple way to achieve this. Not only does it make things easier for your customer, but will also hep you provide an efficient service by knowing where all of your literature is, should someone request a leaflet or brochure. What style of Leaflet Holders are available? There is a Leaflet Holder to suit every need. 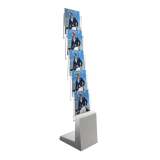 We supply a wide range of perspex Leaflet Holders including counter standing, wall mounted, business cards, multi-purpose, shelf edge mounting and even flat pack Leaflet Holders. At UKPOS we are also able to manufacture Leaflet Dispensers to your specifications, so whatever style of Literature Dispenser you think would suit your business needs, it will be available. 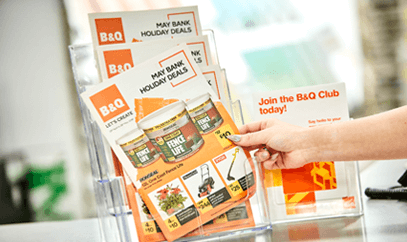 Can acrylic Leaflet Holders be used outdoors? Purpose built Leaflet Holders can be used outdoors as they are manufactured from high impact arcrylic and designed with a lid to keep your leaflets dry and protected from the weather. The lid is also built to auto shut so you never have to worry about your literature. Outdoor Leaflet Dispensers come pre-drilled with fixing keyholes ready for easy wall mounting. Leaflets are great in waiting rooms or receptions when people are idle and looking for something to read. In this situation it is important to have them displayed clearly and neatly rather than scattered across a table for people to dig through. For this job, a Countertop Leaflet Holder is great. Dispensers also work well near to entrances or exits, tills or desks where the customer has to engage so may be likely to pick up a leaflet. If a customer has come to your till or desk, they are already interested in your company so may be interested in taking away some extra information. I have a few different sizes of literature, can they all fit in one dispenser? Yes they can. Some of our Leaflet Holders are designed to fit a number of different leaflets at once, whether that be different sizes or different orientations. For example, this Four Tier Leaflet Holder can hold your choice of A4 paper landscape, two A5 portrait or three 1/3 A4 portrait. This style of dispenser is ideal if you have a variety of leaflets but don’t have the countertop space for multiple Leaflet Dispensers. When should I use a Brochure Stand? 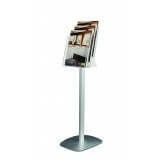 If you have something a little larger than a leaflet, Brochure Stands are a larger floor standing alternative. These would work great for travel agents or department stores.